Over the last several decades, the study of discourse processes has moved from the complementary efforts characteristic of multidisciplinary research, to the explicitly integrative focus of interdisciplinary research. Some organizations have supported the methodological and conceptual merger of areas like literary studies, psychology, linguistics, and education. 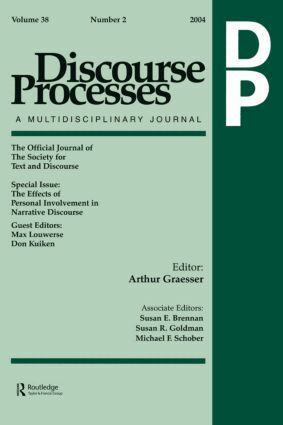 As evident in this special issue, research concerning personal involvement in narrative discourse has benefited from these developments. The five studies supported in this issue examine a range of potential determinants of personal involvement in narrative discourse. These include overt verbalization of thoughts and feelings, foregrounding, preference for genre and protagonists, relevance of the content of a text to the reader, and identifying with a character. These studies also examine different aspects of what is absorbed by the reader, including sophisticated forms of questioning, lasting appreciation of story points, involvement with story characters, commitment to story-consistent beliefs, and changes in the sense of self. Collectively, these studies challenge the conception of what it means to understand media presentations of fictional narratives as well as the conception of the strategies through which such understanding is attained.